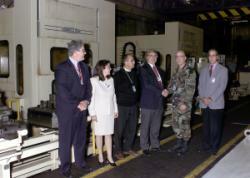 Troy, New York - October 27, 2003 - STEP Tools, Inc. the forerunner in developing STEP and STEP-NC integration software for the global marketplace, announced today the opening of its new STEP-NC Manufacturing Center at the U. S. Army's Watervliet Arsenal, the oldest American manufacturing arsenal located in Watervliet, NY, just north of the state capital at Albany. The announcement follows a formal agreement reached between STEP Tools, the Arsenal and the Arsenal Business & Technology Partnership, a private not-for-profit development corporation created to bring new employers and new technology research and development efforts to the Arsenal site. STEP Tools' offices will be located at the Metal Processing Manufacturing Division, Building 20, at the Watervliet Arsenal Campus. STEP Tools will host an Open House and Reception for special guests at their new STEP-NC Manufacturing Center on November 19, 2003 from 3PM to 6PM. A formal demonstration of the technology will be held from 3PM to 3:45PM. A Press Conference and Dedication of the new Manufacturing Center is scheduled for 2:30PM at the Watervliet Arsenal. All members of the press are cordially invited to this event. "We are very pleased to announce the opening of our new STEP-NC Manufacturing Center at Watervliet Arsenal," said Blair Downie, Vice President of International Sales and Services. "STEP Tools is eager to demonstrate our STEP-NC solutions, and show how this technology will propel manufacturing into a new level of automation, safety and usability. The manufacturing community has been anticipating a major breakthrough in manufacturing automation, and eagerly monitoring the progress of STEP-NC technology. Large and small industrial companies can come and see first hand how this progressive technology can empower their machining operations. The STEP-NC Manufacturing Center at the Watervliet Arsenal will serve as the focal point for "hands on" exploration of STEP-NC in a real world manufacturing environment. The shop floor and demonstration area is comprised of CNC machine tools, CAD/CAM/CAE systems, and a high speed Internet connection. Manufacturing companies will be able to view the latest developments in STEP-NC, a design-to-manufacturing system enabling numerically controlled (CNC) machine tools to be driven by product design data. Watervliet Arsenal's world class manufacturing facility is equipped with machining centers, mills, profilers, and lathes to machine most any part configuration, including high-volume production of both small parts and heavy manufacturing. With more than 1,200 machine tools (including 200 numerically controlled machine tools), Watervliet Arsenal can handle 2-, 3-, 4-, and 5-axis turning, boring, drilling and milling jobs. The arsenal also provides state-of-the-art rapid prototyping of virtually any part configuration of any material. In December 2003, STEP Tools will move their headquarters to a building purchased by the company at 14 1st Street in downtown Troy, NY. The building will house their Research & Development Center, and is located directly across the Hudson River from their Watervliet offices. STEP Tools is internationally renown for their expertise in ISO STEP product data standards. In 2003, STEP Tools introduced their first-to-the-market software solutions to support STEP-NC Implementation Programs and flagship users of this vital, emerging technology.